Roy Hodgson has announced the squad he believes will lead England to the World Cup when they face Montenegro and Poland next week. Needing two wins to guarantee automatic qualification, Hodgson has picked the following squad. Will Lambert be celebrating next weeksquad. Leighton Baines, Gary Cahill, Ashley Cole, Phil Jagielka, Phil Jones, Chris Smalling, Kyle Walker. Ross Barkley, Michael Carrick, Tom Cleverley, Steven Gerrard, Frank Lampard, James Milner, Andros Townsend, Jack Wilshere. 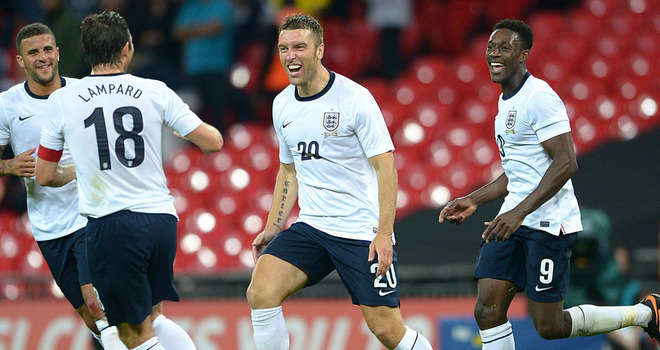 Jermain Defoe, Rickie Lambert, Wayne Rooney, Daniel Sturridge, Daniel Welbeck. A strong looking squad? Anyone you feel is missing and should have been included. Give us your thoughts in the comment box below. This entry was posted in NEWZ stories and tagged Barkley, England Squad by Dominic Hanley. Bookmark the permalink.